Valentine Gif Kisses Collection Gif Kisses Collection Application is an absolutely wonderful collection Of Kisses Gif Or Photo Or Images. 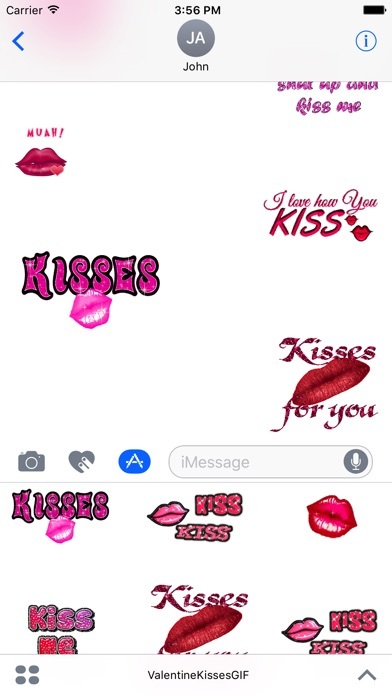 Kiss Gifs is a collection of the best Kisses (animated Gifs) that are easy to share with friends, Girls And Boys on iMessage. Sharing your gif with your friends is now easier. Surprise your friends with amazing GiFs. We want give you the best of Kiss Gif Collection application about GIF. A large number of beautiful and romantic Couple Kisses gif images Or stickers in high quality for you. How to make Your iMessage look cute and awesome....? The answer is - Choose Kisses Couple Gif. Kissing is the act of pressing one's lips against the cheek, head, hand or other body parts of another person, animal or object. Kissing on the lips is a physical expression of affection or love between two people,in which the sensations of touch, taste, and smell are involved.